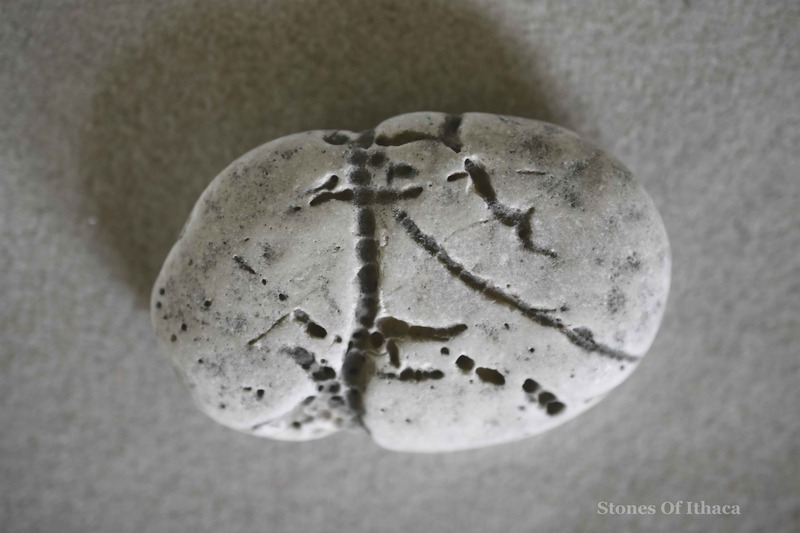 I call this stone a “swimming cross”. Next to the main cross, which has a road leading up to it, is a smaller cross that seems to be swimming through space, like a seed. We will notice that in order to progress through air or water, it is necessary to join one’s legs together. It is only on land that we walk by separating our legs. If you try to fly or swim with your legs apart, you will quickly flounder. They must be joined together, in one place. This is why the Cross is a superior figure, say, to the Vitruvian Man of Leonardo da Vinci, which has its legs apart. The Cross is stable, it will not break like a wall or a tower. The only other figure that shows similar resistance is the triangle – a pyramid. And a circle, though that may bounce or be pricked like a balloon. One detail I love in this depiction is the small bird that has alighted on the transverse beam of the main cross. On the other side of the transverse beam, there is a flag. Both bear witness. Meanwhile, in language, we are sheep, and Christ is our shepherd. He is not a hired hand, he will not abandon his sheep when the going gets tough. The sound that a sheep makes is “Baa!” We will find here the same letters as in the Aramaic word for “father”, “Abba!”, a term Christ uses in the Gospel. As sheep, we are meant to call upon God the Father in this way. But there is another sound that we can make, if we add the ego to the end of “Baa!”, and that is “Baal!” Baal is the name of the false god in the Old Testament. As sheep, we must make up our mind which god we are going to call upon. The good thing, though, is that even if we make the mistake of calling upon “Baal”, by adding breath (h) and applying the phonetic pair b-p, we can return to “Alpha”. It is the same when we step from “AM” (another title of God) to “I’m”, we are still in a position, through the addition of breath, to go to “Him”, that is Christ. It is a question of repentance, of inviting Him in.